Nothing like a little “pre-gaming” before going out with friends. Well, co-workers actually. J’s co-workers. One of the ladies she works with is leaving, so there was a going away party at the University Roadhouse. We’ve already eaten at theRoadhouse (and really enjoyed it), so we thought before we headed over to meet up with everyone, we’d check out the bar next door. 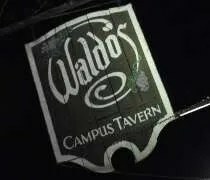 Waldo’s Campus Tavern is on Michigan Avenue pretty much on the campus of Western Michigan University. From the front door, you can look out and see Waldo Stadium. It’s a pretty old-looking, two-story building that doesn’t really have any parking. That kind of screwed us. We parked on Monroe Street thinking we’d be ok. I mean, there were no signs or anything saying we couldn’t park there, but when we got back to the car at 1:00, there was a ticket stuck in my door. Apparently, you can’t park there after 11. So, I really have no idea where you would park if you want to enjoy a night out. After parking, we walked back the half block or so to the front door. It’s a very inconspicuous door. When we got there, J turned to me and asked if it was the right entrance. I told her to pull on it and see if it opened. It did, so we went in. Immediately, we were nailed with the smell of smoke. I was pretty sure I read on their website they were smoke free, so that was surprising. When you walk in, you have two choices. There’s a room off to the left with a bar. I figured out later that downstairs area is the smoking area. To your right is a staircase that leads you up to a bigger room which is non-smoking. We headed upstairs and found a pub table near the bar. There is seating all over the deceivingly large space. To our surprise though, there weren’t many college aged patrons. Most of the bar goers were older than we were. I was expecting a much more juvenile crowd. There was one large table of what looked to be Western students, but all the guys at the bar and the other tables were a much older crowd. That did start to change as the night went on. A waitress spotted us right away and came over to get drink orders. She listed off the specials and I stopped her mid-sentence when she said PBR was a buck. J went with a Bacardi and Diet. She probably should have just said rum and Diet because well drinks were $1.50. Saying Bacardi is just kind of a habit. Before she went to get drinks, I asked for a couple menus which were brought back with the drinks. I knew what I wanted, but J needed a minute, so the waitress left to take care of another table that just walked in. It was quite a while before she got back to us. They don’t have a POS system, so everything has to be written down by hand and handed to the bartender. He would make one drink at a time and she would take them back to the table one drink at a time. That prevented her from coming back to get our order, so it was a good ten minutes before she came back. Not sure where, but I heard they had pretty good pub food, so I was surprised by the very small menu. They have a few appetizers, a burger, chicken fingers, and pizza. That’s it. No sandwiches. No soups. No salads. I wanted a burger, so not a big deal to me. I was a little worried about J and even offered to go somewhere else if she wanted, but she knew I wanted to check the place out so she went along. As you probably guessed, I got the Bar Burger & Fries. For an extra buck and a half, I added bacon and bleu cheese. When the burger was set down in front of me, I didn’t see any bleu cheese. J noticed a cup of something next to my fries, so we dipped a few fries in it to see what it was. Neither of us could tell if it was a bleu cheese sauce or a ranch dressing. I don’t know why they would include ranch with a burger and fries, so it had to be bleu cheese, but since it had almost no taste, I decided not to put it on the burger. It was totally not what I was expecting when I ordered bleu cheese. The burger was way overdone. In fact, I could actually taste that it was burnt. It was dry and flavorless. 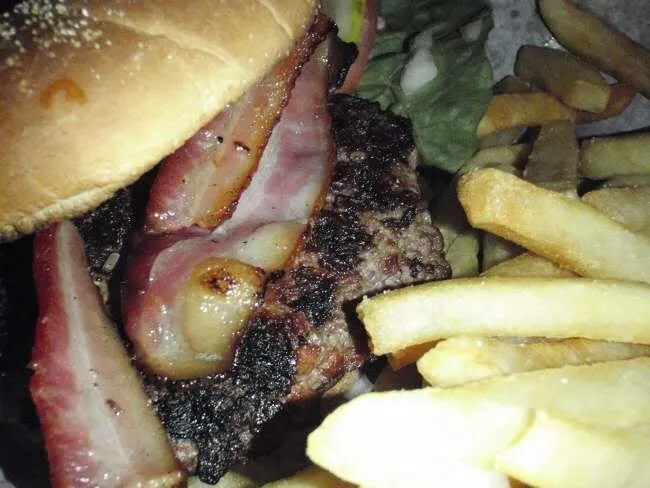 The bacon was alright, but it couldn’t save the burger. They bun was also done pretty well. It was a soft sesame seed bun that had a nice toast on it. The fries were out of the bag restaurant fries. There were quite a few which, at this point, made me really happy. I finished everything in my basket, but the burger was not what I was hoping for at all. J ordered the BLT pizza. The crust was a perfect paper-thin crust that was sauce with a herbed olive oil. 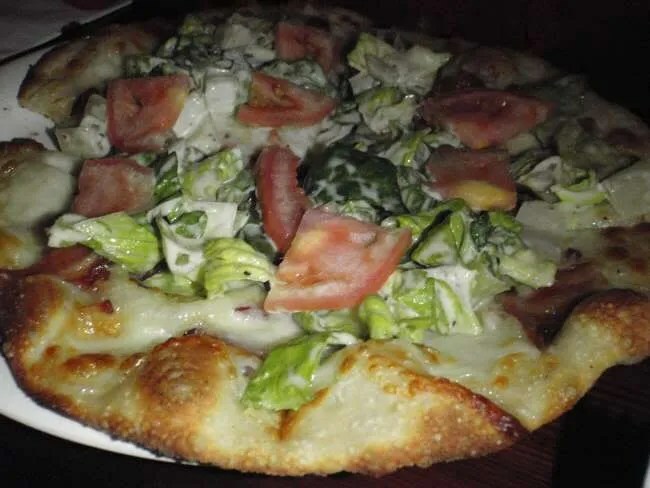 It was then topped with lettuce, tomato, and bacon. The eight inch pizza was about the size of a dinner plate which was the perfect size for her. She enjoyed her meal a lot more than I did and when we walked in, I was worried about the opposite. Our meal, with three drinks (I got a second beer) was just over $21. We spend that a lot of times just drinking Pepsi’s, so that was really surprising. Our meal did take over an hour which was pretty disappointing. The waitress looked frazzled at times. Things were starting to pick up and a second waitress didn’t join her until closer to 9:00, so for most of the meal, she was taking care of the entire bar. 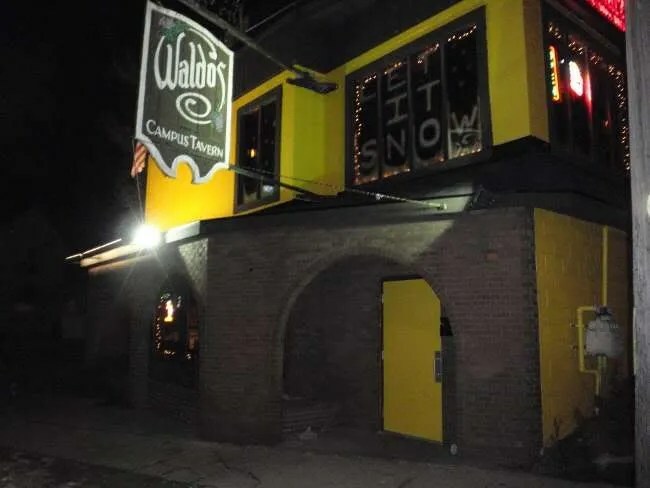 The pizza is definitely the way to go at Waldo’s. The place has a pretty cool atmosphere and some great drink specials. If I’d go back to eat, it would be for a pizza, but I would go back for a drink or two…or six. Ahhhhh, Waldos. I remember some meals there when I was in college.